The 110-Series represents the best a headset can be. Cane Creek's 110 features optimal materials, the most effective seals and the best aesthetics in the market today. 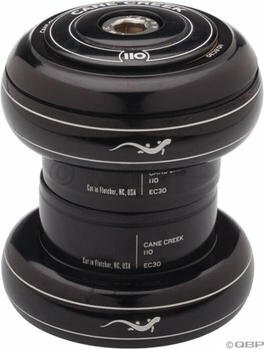 Cane Creek is so confident in the strength and durability of the 110-Series that we stand behind each headset with a 110-year, no-questions-asked warranty. All backed by Cane Creek's unsurpassed customer service. The 110 Classic headsets offer the same premium features of the 110-Series and in 1 threaded and threadless models. Its classic styling is reminiscent of a bygone era and tailored to appeal to those looking for a classic aesthetic with contemporary reliability. If you have any questions about this product by Cane Creek, contact us by completing and submitting the form below. If you are looking for a specif part number, please include it with your message.